Maya Angelou’s brave, defiant poem, first published twenty-five years ago, celebrates the courage within each of us, with a childlike simplicity and intensity that rings true for young and old. She skillfully summons images of frightening characters, with the assistance of the artful Jean-Michel Basquiat, only to send them scattering with her confident words and defiant assertion…”Life doesn’t frighten me at all.” Angelou demonstrates that sometimes, acting brave and sounding brave, are the secret to being brave, even when we’re shaking in our boots. And standing up to our fears exposes what we fear to be scaredy-cats and paper tigers. 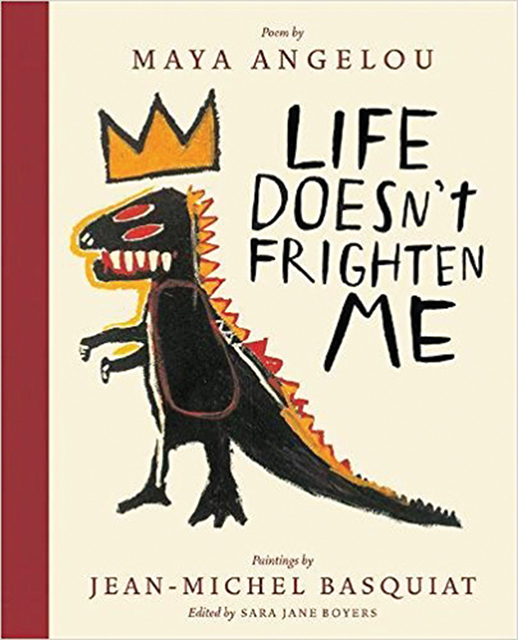 Together, Angelou’s poetry and Basquiat’s illustrations create a place where children of all ages can realize their own fearlessness. Celebrating its successful 25 years in print, this brilliant edition also features brief, updated biographies of Angelou and Basquiat, an afterword from the editor, and a fresh new look.